I've been playing around with it and I'm trying to make up my mind if I prefer any of the System.Diagnostics ways over the 'good-old' IF and exceptions. In case the last way of checking the pre-condition is new to you, check out this excellent guide. 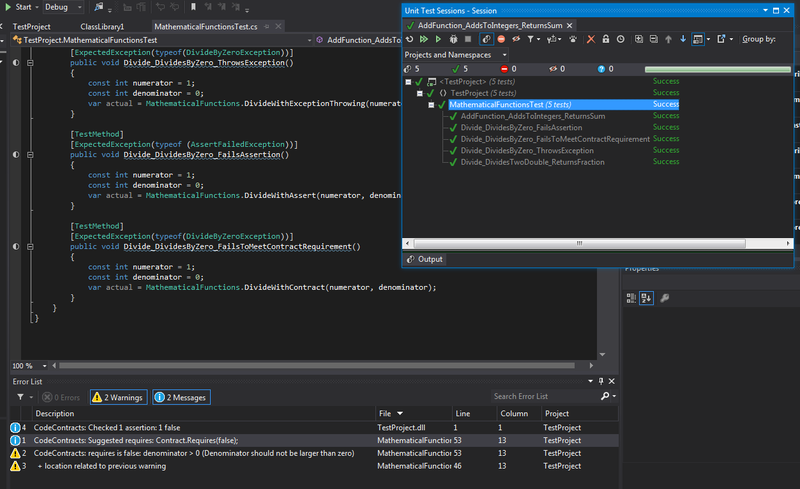 Although the namespaces are included in .NET framework 4.5, you do need to download the Visual Studio add-on for code contracts ( even if you are using VS2012 ) from here. 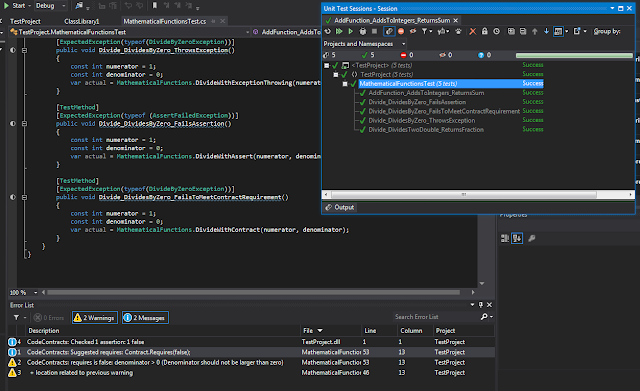 After that you have to open solution properties and go to the code-contracts tab in order to set things up. Also - I needed to set CONTRACTS_FULL compilation symbol in order for my ReSharper to stop fading out my Contract.Requires line, saying that it will be skipped ( as described here ). Note that I can set the exception that needs to be thrown in case the pre-condition is not met, using Contract.Requires<ExceptionType>() syntax. By clicking ignore - the test will continue, the exception will be thrown and the test will pass. However, this is inconvenient and we can easily disable this by setting the "Runtime Checking" to "None" on the assemblies that are being called by the test. The most important benefit is of course compile time feedback on the written code. The static contract checking. You can detect an error even before running a test or the application. It's less verbose than the IF-Exception way, because it takes up a third of the number of lines. It provides more control over the exception that will be thrown than Assertions. As far as I know, either an AssertionFailedException is thrown or not. I cannot find any downsides at this point. Feel free to leave any feedback about aspects I might have overlooked.